I used to hate mornings. Granted, I used to be chronically depressed and anxious and addicted to stuff that made sleeping all day a preferred activity. But here we are present day. I am now a huge fan of the AM. And there have been a lot of changes that have led to my new-found love for it. These days I am all about treating myself kindly, and I look at getting up most mornings (most mornings = I’m human) as a chance to do that. I’ve also got a lot of different creative projects on the go that I’m excited about. And I’m way healthier than I used to be, and generally just feel better and am more optimistic about what each day might bring. But there’s something else I use that helps me love the morning. I use it every day to help inspire me, light me up, and keep me focused on putting my health and wellness first. Danielle Laporte’s Desire Map Planner. I wake up, make a tea, and sit down to plan my day. And I don’t just focus on the stuff I need to get done: I focus on keeping my wellbeing at the top of the list. The desire map planner helps me put some thought into the purpose behind what I’m adding to my to-do list, rather than making it a race to get the most things done. I know how many incredible things I can accomplish when I make wellness my top priority, not packing my schedule. If I want to feel the opposite, I scroll social media (Fun fact: there’s a section called “Stop Doing” in the planner where I always put “scrolling social media”). Does it really need to be done, or am I doing it because I think I have to? Will it help get me where I want to get, health-wise? Will it help me get where I want to get, career-wise? Will it help me to feel proud/motivated/empowered? The daily desire map planner (there are weekly ones, too, which you can check out via the link at the end of this post) gives me the space to remind me to do normal stuff, like go to Costco for coconut milk, while also reminding me to hone in on my wellbeing: If I’m not feeling up for the drive or the line-ups, I buy what I need locally. The old me would have gone anyways and been miserable the whole way, spreading the low vibes to everyone I came into contact with. That version of me had zero practice putting her wellness needs at the forefront. The desire map planner helps remind me to plan my day with my mental health and wellness in mind. It’s planning with how you want to feel in mind. Your feelings are important. If you follow them (the ones that feel joyful, not ragey) they’ll lead you in the optimal direction. The desire map planner helps you do that. 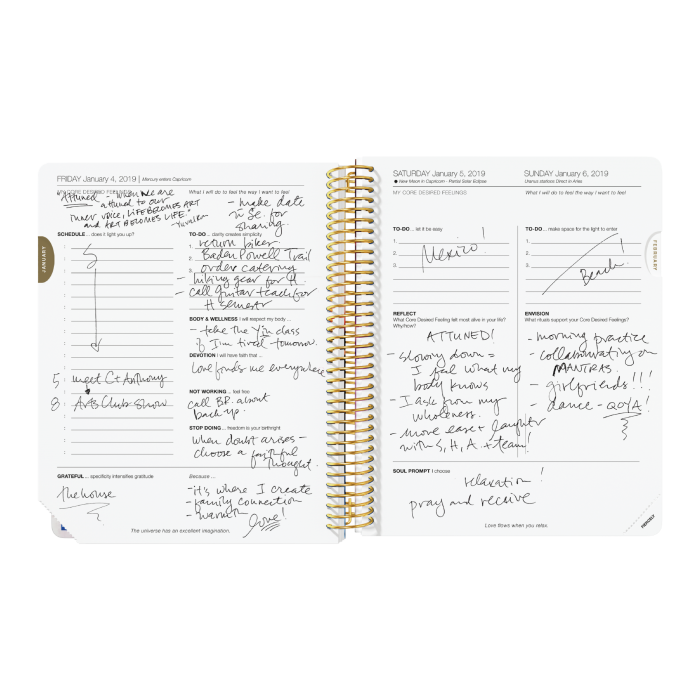 I’ve never seen any other daily planner like this on the market. If I were Oprah I’d give it to everyone I knew for Christmas. But instead, I’m going to order one before they sell out, and suggest that you do the same.